Brillant! I love it. What a great idea! I never thought of them as long pentagons, that makes so much sense. I might just break out my yarn and hooks and crochet one of these tonight for our tree. well, it’s brilliant; a brilliant star. And i’m so pleased that you’ll be sharing the pattern! That is the coolest knit I’ve seen in a long time. 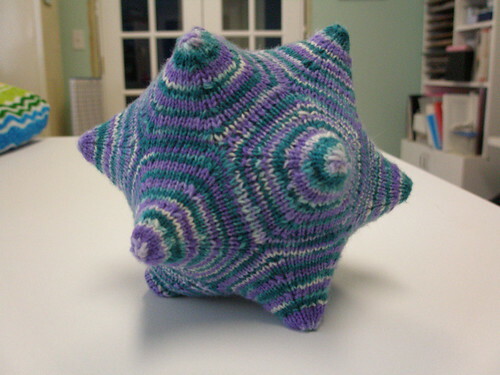 I have a feeling all of the profs in my department will be asking about it once I knit one for my desk! That is such a pretty star! What yarn did you use? It looks super soft, like something just perfect for baby things or scarves/shawls. A softie dodecahedron – perfect! Genious! It is absolutely amazing! Do you need an apprentice…I can bring you coffee :), or hot chocolate. I LOVE this! Yay for the free pattern (will keep a lookout)–our tree needs a new star this year! I love this! It’s so original and looks like it would a fun knit. I can’t wait for the pattern to come out. Thanks!!! Soft and sharp edges – genius. I just want to squish it! It’s beautiful – love it! Although that yarn looks too nice to be drooled on, it also looks like a cool baby toy. I can’t wait for this pattern – seriously, CANNOT wait. I won’t be using it for a treetopper, but I WILL be making a couple in bulky yarn to use as throw pillows for my couch. Whee! I love it, and I’m off to see if it’s in your projects on Ravelry. Those gnomes inside that keep insisting it’s a hat probably feel a bit squashed though. Ooh! You could do each “point” in a different color, maybe put some rattly things inside, and it would be an awesome baby toy. It looks like the everlasting gobstopper from the movie Willy Wonka and the Chocolate Factory. Wow! That’s awesome! It’s even better than the wisdom tooth I guessed when you showed the first peek! The star is incredible. Our tree has been naked on top for YEARS. While the boys were little, we used an oversized “Clifford the Big Red Dog” plush ornament for the topper. I could never find what I wanted. We wanted a star – a simple star, not one that lights up or blinks or has garland around it. I did find a star last year, but now, I don’t know. . . . If I carried some Metallic FX or Lazer FX along, it would be all beautiful and sparkly. . .
Wow, Norah, I love that star! Such a cool architetural shape–I can’t wait to make one myself when your pattern is available 🙂 Thanks! I can’t wait to make myself a new star hat. I will leave one point off, do some ribbing instead, woo hoo! Must be something in the air — Knitty has a dodecahedron (convex, not stellated) in the winter issue too. Added to Faves on Ravelry. I absolutely can’t wait until this pattern is available. I would love to knit one for everyone I know. Great gift for my knitters in my groups. Stellar performance! I love it and would love to see it made with some mohair with metallic! Love the star! Looks like a Moravian Star to me!!! Cool! How do you attach it to the tree? Norah- I have one almost finished star but I kept thinking about toys and different forms that this could take-so before I finished the star I cast on with some sock yarn and have a figure with wavy arms instead of points its more like a sea creature than a star-I am contemplating i-cord worms for each of the arms with elastic inside so they can be pulled out but will snap back in also. Norah, you know I love your designs and this was FANTASTIC. My only complaint was the pattern was put out too late for me to finish by Christmas Eve! I finished 9 of the 12 points before company came and realized I had thrown out the bag of fiberfill which was hanging around my house for years waiting for a use…oh well. Had a blast knitting it and can’t wait for it to don my tree next year! I love this pattern and made it up to give to my newly born niece. I must say, your designs really stand out in beauty, design and inspiration. They are the most interesting ones out there and make a knitter wanna pick up a set of needles and create one of them. This dodec. caught my eye immediately and I can’t wait to make one, but there’s about five or more of your designs elsewhere I am wanting to make first. Now the problem is to decide which one! Thanks for your inspiring patterns!